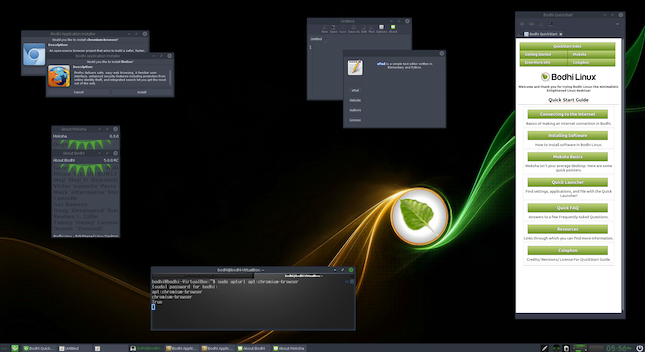 One of the best things about there being so many Linux distributions, is it can be fun to try them all. Believe it or not, "distro-hopping" is a legit hobby, where the user enjoys installing and testing various Linux-based operating systems and desktop environments. While Fedora is my reliable go-to distro, I am quite happy to try alternatives too. Hell, truth be told, I have more fun trying distributions than playing video games these days, but I digress. A unique distribution I recommend trying is the Ubuntu-based Bodhi Linux. The operating system is lightweight, meaning it should run decently on fairly meager hardware. It uses a desktop environment called "Moksha" which is very straightforward. The Enlightenment 17 fork is a no-nonsense DE that both beginners and power users will appreciate. Today, version 5.0.0 finally becomes available. This follows a July release candidate. "For those looking for a lengthy change log between the 4.5.0 release and 5.0.0, you will not find one. We have been happy with what the Moksha desktop has provided for some time now. This new major release simply serves to bring a modern look and updated Ubuntu core (18.04) to the lightning fast desktop you have come to expect from Bodhi Linux," says Jeff Hoogland, Bodhi. Hoogland further says, "If you installed a pre-release of Bodhi 5.0.0 you will simply need to run your system updates to grab all the latest goodies that are in these ISO images. Keep in mind that system updates will not adjust the look of your desktop automatically though because this would require messing with custom configurations you might otherwise have already." The lack of a change log is surprising, but apparently, the move to an Ubuntu 18.04 base from 16.04 is the only major difference. With that said, updating the base is rather significant, so that alone should be worth the upgrade. The improved "modern" user experience should also excite users -- eye candy does matter. If you are happy with your existing 16.04-based Bodhi 4.5.0 installation, Hoogland reminds that it will be supported until 2021, so there is no urgency to upgrade. Whether you are an existing Bodhi user, or someone looking to try it for the first time, you can grab the standard 64-bit ISO here. If your computer is only 32-bit, a legacy ISO can be had here.